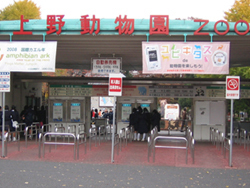 There are nation’s top academic museums, art museums, and zoo in Ueno. It is also a historical town where shine with 1890 years of history, and temples since the “samurai” Edo Period still exist. In addition to that, the full cherry blossoms should impress you in late March. By the way, Japanese people tend to feel the “start of new year” by viewing cherry blossoms. ou could see two of the World’s 3 Rare Animals, Okapi & Pigmy Hippopotamus. The animals you could see here are approximately 500 different types, the No.1 figure in Japan. It’s also working hard on protecting endangered animals, such as breeding and propagating Lowland Gorillas. A temple built by Hidetada Tokugawa, one of the shoguns of Edo Period (1603-). It is a highly-ranked temple where bodies of 6 shoguns of Tokugawa shogunate that lasted for 15 generations are buried. 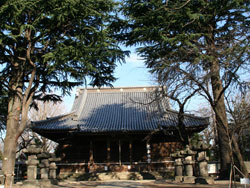 The current main temple had been built in Kan’ei 15 (1638), and was moved from Kawagoe (Saitama Pref.) to the current location in the Meiji Period. In Edo Period, Ueno Park and the area around it have all been the territory of Kan-ei Temple, with over 30 pagodas & religious architectures. Most of them have been burned down, but few of them such as “Shimizu Kannon-Do” and “Ueno Toshogu” survived the fire, and are handing down the history even now. Tokyo National Museum inaugurated in Meiji 5 (1872) as the first museum in Japan, and was moved to its current location in Meiji 15. The museum holds collections and exhibitions of artworks, historical materials, and archaeological legacies from various countries & cultures of Japan & Asia. The museum is also responsible of research & surveys of such cultural assets. As if to verify its position as Japan’s oldest museum, it holds a total of over 110,000 articles, 87 national treasures, more than 610 important cultural assets as its property. Due to such enormous amount, the museum is divided into 5 exhibition buildings. Extremely recommendable to those who have interests in cultures of ancient Japan as well as the whole East. 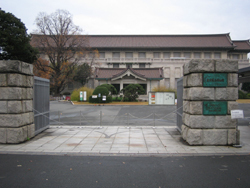 National Museum of Nature and Science, Tokyo was established in 1877 (Meiji 10), and is one of the oldest museums in Japan. 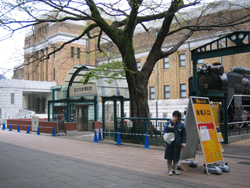 It is also the only national general science museum in Japan. The exhibitions are being held actively as the world’s nucleus in natural history & historic research of science technology as well as the leading, core museum of the whole nation, with valuable collections consisting of approximately 370,000 articles being kept. This museum was also the first museum in the world to introduce the “Theater 360” that enables a 360 degrees view on screen, which is definitely worth seeing. Have you ever seen cheery trees? When spring comes (late March to late April), the place is filled with blooming flowers of cherry called “Somei Yoshino,” creating an extremely illusive scenery. Also, you would be able to enjoy a lively scenery with people everywhere doing “Ohana-mi,” a traditional Japanese custom to festively admire the cherry blossoms. And if you have the chance to be in Japan in April, let’s have a drink together with us Japanese, under the cherry trees. 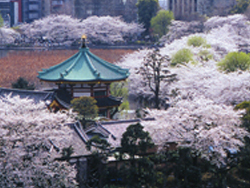 For your information, Ueno Park has 50 other different types of cherry trees aside from Somei Yoshino. They slightly vary in blooming time, so you would be able to enjoy various cherry blossoms throughout the period from February to late April. copyright c uechun. all right reserve.